Epoxy is a sticky reality in the world of jewelry making. You need it to secure half-drilled pearls to earring posts. It cushions opals against breakage in cabochon settings. And it allows you to create unusual, prong-free settings. If you aren’t careful, though, you’ll discover you’ve smeared swaths of Part A and Part B all over your work area and on your designer clothes. Worse–sometimes the stuff may not work, and that grommet you carefully set in a large-hole bead can shrug itself off. Darn. The solution: metalsmithing adhesives. Make sure all parts are clean. Use fresh epoxy. I’ve been using Devcon Home 5-Minute Epoxy, but you have to work fast. Some experts use G-S Hypo Cement, with its needle-like applicator. Those same experts say you should avoid using E6000 and super glues. Super glue is brittle. When you pick up some fresh epoxy, test it. Glue a sample project together to make sure the stuff holds. Wear nitrile gloves and eye protection. Have plenty of ventilation when using metalsmithing adhesives. Don’t attempt to glue parts together when you are frustrated. 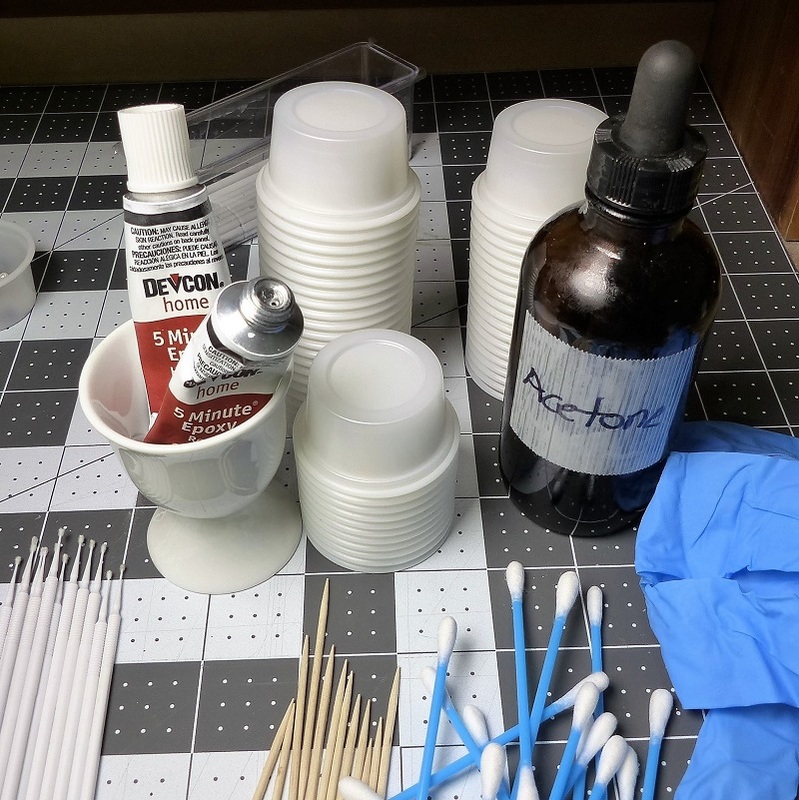 Metalsmithing Adhesives: Tips You Can’t Live Without! 1. When you open a tube of fresh epoxy, use a pin to pierce a hole in the foil seal. Don’t use the punch that is built in to the cap–it’s too big. The pinhole eliminates a lot of the mess. 2. Store your opened tubes upright in a small cup. This also keeps the mess down. 3. Fill a glass dropper bottle with acetone. This is great for cleaning up wet epoxy. A little squirt on a cotton swab or small strip of cotton rag and the worst is over. 4. When done for the day, use an acetone-soaked paper towel to wipe off the metal threads of your tubes and the insides of the caps. 5. Working with tiny stones or pearls? Use a piece of sticky wax to pick them up. 7. Pick up some disposable, super fine micro brushes from a hobby railroad or model airplane shop. I get mine from micromark.com, $10.95 for 100. 1. Have everything you need placed on your bench top so you don’t have to search for something at the last minute. 2. Make sure your stone fits your setting. 3. Roughen all surfaces that will come into contact with each other. Use cutters to gently press a couple indentations along a pearl post. If you are setting a cabochon, rough up the back of the stone and the metal surface with sandpaper and a diamond bur. Same for grommets. 4. 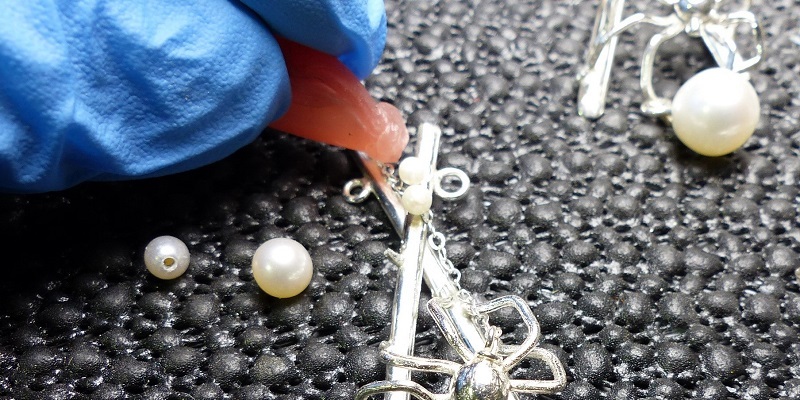 I use pliers to widen the end of a pearl post a tiny bit–so that it will still fit into the pearl but will be anchored in place when the epoxy hardens. 5. Check again to make sure the stone or pearl still fits. 6. Grab a stack of cups, and turn one upside down, so the bottom is facing you. 7. Squeeze a small amount of Parts A and B on opposite sides of the cup’s bottom. 8. Use the superfine micro brush to grab equal portions of Parts A and B and mix them together in the center of the cup. You only need to mix the two parts for 10 to 15 seconds. Slower-setting epoxies should be mixed for a minute. 9. Dab some of the epoxy into the hole of the pearl or back of your stone. Brush more epoxy on the metal, then press both parts together. Less epoxy means less to clean up. 10. I use Teflon-style dental floss as a clamp, tightly wrapping it around the stone and setting. Adhesives don’t seem to stick to Teflon. 11. Gently wipe away the excess with an acetone-doused swab or cloth. If you’ve used the epoxy sparingly, you can also scratch away the excess, once it’s hardened, with your fingernail. 12. Allow to cure; 5-minute epoxy cures in about an hour. 13. Hang on to that plastic cup. Make sure the epoxy hardens in the spot where you mixed the two parts together. 14. Stack another cup on top of the old one for your next bonding project, to prevent the stickiness from spreading. 15. Want to eliminate plastic waste? You can reuse your superfine micro brush by wiping the fresh epoxy off with an acetone-soaked rag. Same for the plastic cup, if you are working on a bunch of settings. What Could Possibly Go Wrong with Metalsmithing Adhesives? The pearl won’t fit on the peg and now I have adhesive everywhere. Everything is sticky, even though I followed these instructions I created just for you. I forgot to put my magnifying glasses on and couldn’t see what I was doing and didn’t know where I had put them anyway. Meanwhile the epoxy hardened and everything is still sticky. I get frustrated and try to press the pearl down on the peg with a pair of pliers. The pearl breaks. I drop a pearl on the floor of my studio. It’s full of epoxy and I know I will never find it again. My epoxy never sets and the pearl falls off. I don’t like where I placed the pearl and now it is stuck on for life. Well, not exactly. Sometimes I can wrap the pearl in wet paper towel. Then I heat the metal setting for a few seconds with a fine-tipped torch on low until the glue melts. 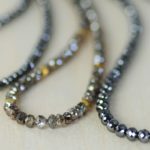 Betsy Lehndorff has been writing for Lapidary Journal Jewelry Artist since 2010. You can reach her at betsylehndorff@gmail.com.